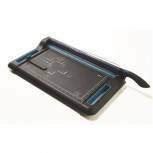 Dahle Personal Trimmer A3 508 Pack of 1 Low volume precision trimmers sturdily constructed in metal have an automatic clamp which holds the item to be cut. The table area is pre-printed with three scale bars in metric with photograph size. Capacity of 5 sheets of 70gsm paper. 460mm cut. Q-Connect Rotary Trimmer A4 KF17011 Pack of 1 Q-Connect rotary trimmer for cutting paper up to A4 size. Effortless to use with easy cutting mechanism. Sharp edge for a cut that is precise and clean. Cutting capacity - up to 10 sheets of 80gsm. Cutting Length - 320mm. 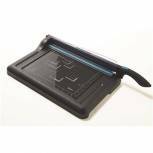 Q-Connect Rotary Trimmer A3 KF17012 Pack of 1 Q-Connect rotary trimmer for cutting paper up to A3 size. Effortless to use with easy cutting mechanism. Sharp edge for a cut that is precise and clean. 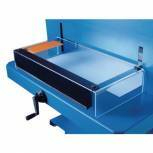 Cutting capacity - up to 10 sheets of 80gsm. Cutting Length - 440mm. 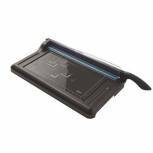 Avery Photo and Paper Trimmer A3 TR003 Pack of 1 A3 photo and paper trimmer designed for home and office trimming of digital photos and paper. 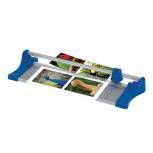 Guidelines on baseboard makes cutting photos to standard sizes quick and easy. Capacity 5 sheets. 440mm cutting length. 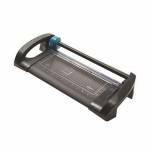 Dahle Professional Rotary Trimmer A3 552 Pack of 1 510mm rotary trimmer with self sharpening blades totally enclosed in a plastic housing. Automatic see-through paper clamp. Steel pre-printed cutting table base. Adjustable backstop and scale bar calibrated in inches and centimetres. 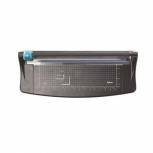 Avery Precision Guillotine A3 PG460 Pack of 1 Heavy duty guillotine for effortless cutting of large volumes of paper. Features include self sharpening stainless steel blade. Locking mechanism which automatically locks the blade down. Steel baseboard printed with mm inches and photographic sizes. A3. 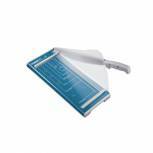 Avery Office Guillotine A4 GUA4 Pack of 1 Easy to use guillotine with self sharpening steel blade. Built in locking mechanism. Table area markings for accuracy of cut. Folding safety guard and ergonomically shaped handle. A4 - 310mm cutting length. 15 sheet capacity. 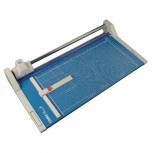 Avery Office Guillotine A3 GUA3 Pack of 1 Easy to use guillotine with self sharpening steel blade. Built in locking mechanism. Table area markings for accuracy of cut. Folding safety guard and ergonomically shaped handle. A3 - 420mm cutting length. 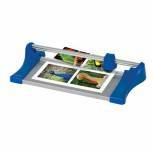 Avery Photo and Paper Trimmer A4 TR002 Pack of 1 A4 photo and paper trimmer designed for home and office trimming of digital photos and paper. Guidelines on baseboard makes cutting photos to standard sizes quick and easy. Capacity 5 sheets. 315mm cutting length. Avery Precision Trimmer A4 P340 Pack of 1 A4 Rotary trimmer with the safety of an enclosed cutter head. 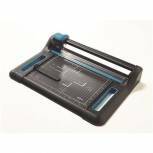 Self-sharpening steel rotary blade and steel baseboard with comprehensive metric and imperial scales that includes paper size indicators for quick alignment of papers. Capacity - 30 sheets. 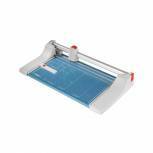 Dahle Professional Guillotine A3 534 Pack of 1 Dahle 534 A3 guillotine. Cuts up to 15 sheets of 80 gsm paper. 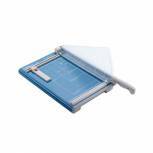 Features measurements in DIN sizes and cm adjustable back stop and manual paper clamp to hold papers securely. Cutting length 460mm. 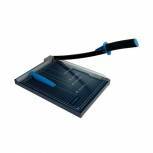 Dahle Professional Rotary Trimmer A0 558 Pack of 1 1300mm rotary trimmer with self sharpening blades totally enclosed in a plastic housing. Automatic see-through paper clamp. Steel pre-printed cutting table base. Adjustable backstop and scale bar calibrated in inches and centimetres. Dahle Professional Rotary Trimmer A1 556 Pack of 1 960mm rotary trimmer with self sharpening blades totally enclosed in a plastic housing. Automatic see-through paper clamp. Steel pre-printed cutting table base. Adjustable backstop and scale bar calibrated in inches and centimetres. Dahle Stand For 842/846 Cutter 712 Pack of 1 Dahle Guillotine Stand 00712. 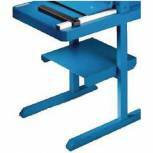 Sturdy construction designed to hold heavy duty Dahle guillotines, models 842 and 846. Colour - Blue. (Guillotine not included). Non returnable. 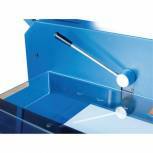 Dahle Heavy Duty Cutter 00842 Pack of 1 Features a metal safety guard whilst a viewing slot enable cutting positions to be checked. Comes complete with a manual clamp together with an adjustable backstop. 720x590mm. 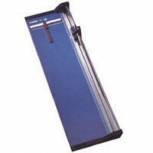 200 sheet capacity(70gsm)Non-Returnable. 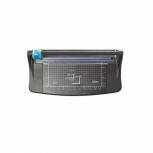 Dahle Heavy Duty Cutter 00846 Pack of 1 Cutting length 430mm, paper capacity of 550 80g sheets plus lockable adjustable backstop, 4 adjustable markers, cutting line, Plexiglas cover over table area and clear cover prevents access to the blade. Non returnable. 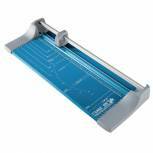 Dahle Premium Rotary Trimmer A3 442 Pack of 1 Dahle 442 A3 professional rotary trimmer. 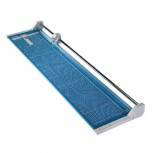 Cuts up to 35 sheets of paper up to 510mm in length. Features self sharpening blade that cuts in either direction. Paper clamp. Metric and imperial measurements and sturdy metal base.